Seattle, Washington. 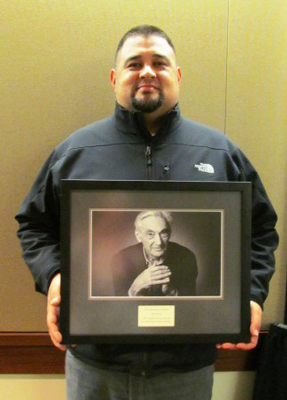 (November 17, 2012) – The Zinn Education Project presented Mexican American Studies program co-founder Sean Arce with the 2012 Myles Horton* Education Award for Teaching People’s History at the National Council for the Social Studies (NCSS) conference on Nov. 16, 2012. Sean Arce with the Myles Horton Education Award for Teaching People’s History at the 2012 National Council for the Social Studies (NCSS) conference. Deborah Menkart, William Holtzman, Sean Arce, and Bill Bigelow. Lauren Cooper, Sean Arce, Bill Bigelow, and Deborah Menkart. 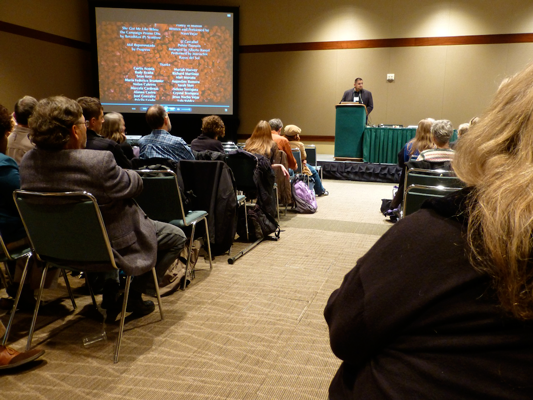 Sean Arce's parents and children flew to Seattle for the award ceremony at the National Council for the Social Studies conference. One of the attendees at the award ceremony for Sean Arce was 100-year-old Dr. Isidore Starr, known as the founder of law-related education in schools. Starr served in 1964 as the NCSS president and resided in Arizona for many years. 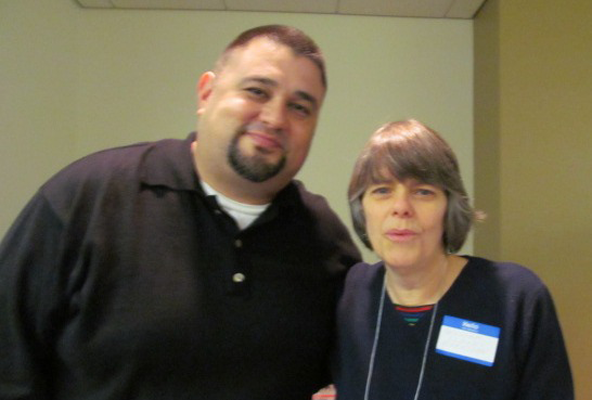 Mary Beth Tinker (Tinker v. Des Moines) attended the award ceremony and saw Sean Arce again at Bill Bigelow's workshop on the U.S. Mexico War. Following the film screening of Precious Knowledge and the award, Sean Arce responded to questions. The NCSS conference is the largest annual convening of social studies teachers in the country. 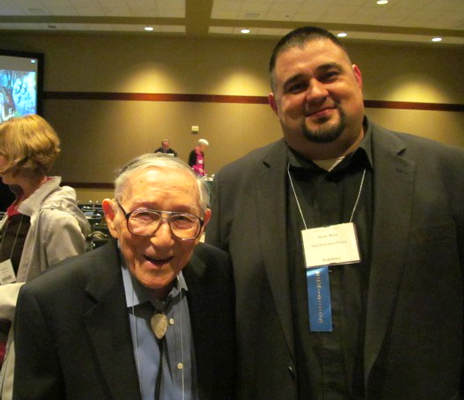 The awards ceremony was attended by many guests of note including 100-year-old Isidore Starr, founder of law related education; Susan Griffin, executive director of NCSS; former NCSS president Syd Golston; Mary Beth Tinker of the landmark Tinker v. Des Moines Supreme Court case; and, most important, Sean Arce’s family. Arce’s parents and two children flew to Seattle for the special occasion. 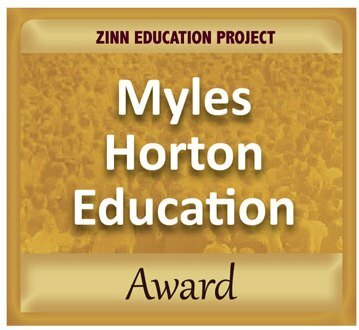 The Myles Horton Education Award honors those who promote democracy through education by ensuring that students have the knowledge and skills to be informed and active participants in their communities, country, and the world. 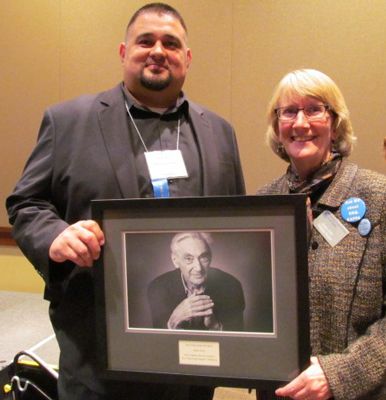 The Zinn Education Project selected Sean Arce for his instrumental role in nurturing one of the most significant and successful public school initiatives on the teaching of history in the United States. 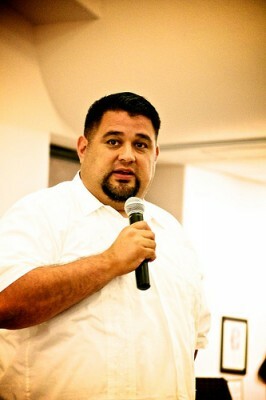 Arce spoke to the attendees about the fight to re-institute the program and the values it instilled in young people. In response to a question about how to engage youth who have been marginalized, he described the need to make sure that every student knows that the teacher feels blessed or lucky to have her or him in the class. Syd Golston commented that not only did the program attend to students’ social-emotional needs, it also provided a high-quality, academically-rigorous curriculum. It is that attention to the well-being and opportunities for every child that made the Mexican American Studies program such a success. We feel lucky ourselves to have Sean Arce and his family with us for this award ceremony and the conference overall. We look forward to the day when Sean no longer has to travel around the country defending an effective program and instead can be back in Tucson full-time making sure more students feel blessed, challenged, and supported in school. 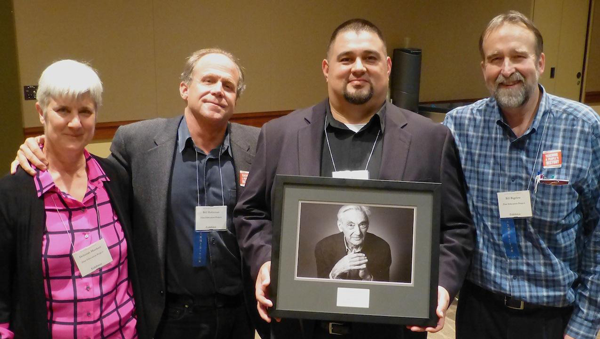 The Zinn Education Project is joined by many educators, writers, and policy makers in our respect for the invaluable achievements of Sean Arce. Sean Arce is a hero and a viral educator. —Luis Alberto Urrea, 2005 finalist for the nonfiction Pulitzer Prize. Sean Arce. Photo courtesy of Save Ethnic Studies. 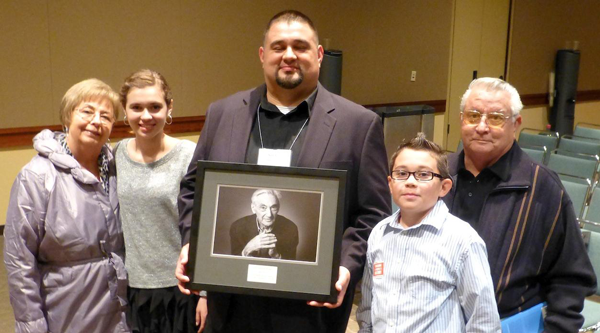 Sean Arce’s father was a glazier and ironworker whose union struggles gave Sean his first taste for social justice. His mother worked as a translator, giving voice to those unable to speak English as they navigated the U.S. legal and financial worlds. Both instilled in him a sense of service to others. At its essence it was a grassroots effort accompanied by a solid academic plan. Arce and the framers of the program did the research as to how to make the material age appropriate and meaningful for the students. Since Arce started in 1999, the program grew from a single American History Mexican American Perspective class to some 44 high school-level classes throughout TUSD, and more at the elementary level. The Mexican American Studies program, documented in the film Precious Knowledge, has been under attack from the state legislature and from the state superintendent of schools. Arce has played a central role in the public, legal, and political campaigns to reinstitute this invaluable program. 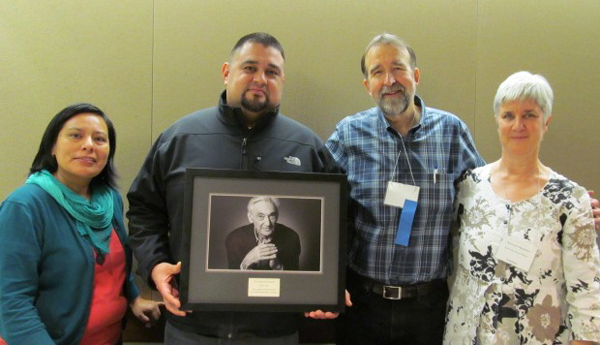 The Zinn Education Project promotes and supports the use of Howard Zinn’s best-selling book A People’s History of the United States and other materials for teaching a people’s history in middle and high school classrooms across the country. Founded with the support of Howard Zinn, the project is coordinated by two nonprofit organizations, Rethinking Schools and Teaching for Change. Close to 20,000 teachers from every state are registered for the project, 25,000 teachers visit the website each month, and more than 75,000 teachers receive the project news. The project’s goal is to introduce students to a more accurate, complex, and engaging understanding of U.S. history than is found in traditional textbooks and curricula. Zinn’s A People’s History of the United States and Voices of a People’s History of the United States emphasize the role of working people, women, people of color, and organized social movements in shaping history. Students learn that history is made not by a few heroic individuals, but instead by people’s choices and actions, thereby also learning that their own choices and actions matter. We believe that through taking a more engaging and more honest look at the past, we can help equip students with the analytical tools to make sense of—and improve—the world today.